Both the Panthers and the Sea Eagles were coming off fairly catastrophic losses when they met at Brookvale Oval on Saturday afternoon. Both teams had conceded twenty-six points by the thirtieth minute of their previous fixtures, while Penrith had ended up losing 50-18 to the Broncos at Suncorp and Manly had lost 56-24 to the Roosters at Lottoland. It was just as important, then, for both teams to amp up their defence as score points and to ensure that, if they did lose, it wasn’t by too much. To make things just that little bit more suspenseful it was an unseasonably hot afternoon at Brookvale, and both teams seemed a bit flustered from the moment they hit the field, resulting in one of the messiest opening halves in weeks, replete with one error, lost ball and awkward changeover after another. The Sea Eagles were especially frustrated, presumably because they were coming off an even more drastic loss, and a loss at home, and continually failed to make the most of linebreaks, despite eventually heading into the sheds two points ahead of Penrith. One of their first opportunities came after a break from Taniela Paseka. It was followed by a pair of penalties for Penrith – one for James Tamou for crowding, and one for Moses Leota for a hand in the ruck that forced Addin Fonua-Blake to cough up the footy right on the line – but these errors probably did the Sea Eagles more harm than good. Even if they piggybacked them up the other end, and got Daly Cherry-Evans the first two points of the game, they fractured the Manly momentum and disrupted what was shaping up to be their first tryscoring sequence of the game. Shortly after, a deft inside pass from Dylan Walker set up Kelepi Tanginoa for an even more spectacular linebreak. Things got a bit disorganised for a moment, but Tom Trbojevic made up for it by taking the final kick on the chest and sending the Steeden across to brother Jake, who grubbered it through the posts and into the in-goal area, where Dallin Watene Zelezniak only just managed to punch it into touch, setting up the Sea Eagles for a goal line dropout and another shot at the first four. Once again, though, it came to nought, thanks to a bit of hasty play from Walker combined with an odd decision from Moses Suli to kick on the final tackle rather than just barge through from half a metre out. With James Maloney cleaning up the footy as clinically as ever, there was a sense that the Sea Eagles had used up their early opportunities and that the momentum had shifted in the Panthers’ direction. Sure enough, Dean Whare put down the first try a couple of sets later, thanks in part to a pinpoint kick from Maloney that found Jorge Taufua on the chest, but forced the big Manly winger to send it over the sideline, gifting Penrith a dropout of their own. At the end of the next set, the mountain men ferried the ball over to the right side of the field, where a beautifully timed pass from Tyrone Peachey saw Whare elude some pressure from Brian Kelly to simply fall, ball first, over the line for the first try. No surprise that the Sea Eagles responded with yet another linebreak, nor that it came from Marty Taupau, who muscled his way through the ruck with the combination of bulk and footwork that has become his signature, in what was probably the biggest gesture of conviction for Manly since Jake Trbojevic had kicked the ball through the posts. 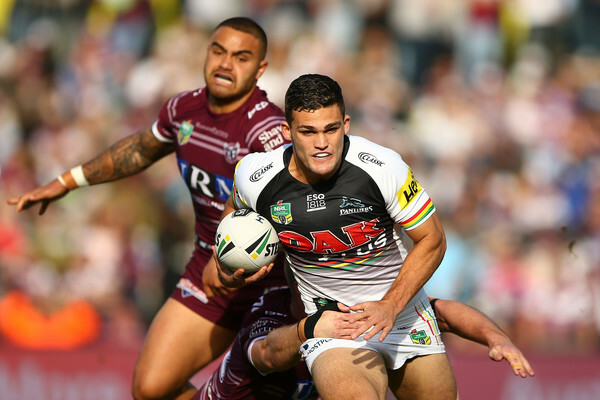 It was doubly frustrating for the home crowd, then, to see Manase Fainu to respond hastily, collecting the football but kicking it too hard and granting the Panthers a seven tackle set to bring the Manly attack to an abrupt halt. Still, an error in the play-the-ball from Corey Harawira-Naera led to yet another turnover, while Fainu got a chance to make up from his error shortly after, as the Sea Eagles started to consolidate in the final minutes of the first half. While you couldn’t exactly compare Taufua’s huge hit on Whare to Greg Inglis and Latrell Mitchell’s hit-ups during Origin this year, it did serve the same purpose of sending a message to the opposition, dishevelling the Panthers enough for Josh Mansour to take the risk of popping the ball back into the field of play after a massive boot from DCE downfield. The result was the final dropout of the first half, and the Sea Eagles made the most of it, putting in a stellar set that culminated with Fainu sliding through the Penrith defence and dodging out of at least three tackles right on the line to slam down the footy fifteen seconds before the siren. If Fainu’s botched kick had undone Taupau’s linebreak ten minutes before, then this linebreak felt cut from the same cloth as Kapow’s huge effort – tough and dexterous at the same time – making this an especially cathartic half time sight for the Sea Eagles once DCE had added the extras. Things just got better from there for Manly too, as Brian Kelly proceeded to put in one of his best twenty minutes of football this year once the Brookvale army trotted back from the sheds. His first contribution was the best linebreak of the night so far – a mad dash out of the ruck that saw him elude Whare, Merrin and the rest of the Panthers defence. DCE saw the play from a mile away and sped up behind for one of his best support effort in weeks, collecting the football from his centre at just the right moment before adding six more resounding points to the Sea Eagles’ scoreline. Given his divisive media reputation, there’s always something especially rousing about seeing DCE put down points for the Sea Eagles, and this was no exception, as the team seemed to consolidate and focus around his terrific effort. Still, Kelly was the star of the show, going from try orchestrator to tryscorer shortly after, thanks to a beautiful pair of passes from DCE and Turbo that saw him crash over in the left corner. After a clutch try and a linebreak try, it was great for the Manly fans to see the Sea Eagles score off pure organisation – and this was the first time since their game against the Storm in Round 13 that Manly really felt completely organised too. If Kelly could produce organisation, he was just as capable of producing spectacle, as evinced in the next try, one of the most memorable of Round 20 so far. It started with a beautifully weighted grubber from Turbo that bounced high in the air right on the dead ball line, eluding DWZ, Whare and Taufua who all came up against it and each other in a chaotic mass. With that kind of ball, the skill lies in being able to slow down and stop at short notice, rather than follow it forward, and that’s just what Kelly did, in a display of utter dexterity that culminated his brilliant footy afternoon. It was a move that looked even better in slow motion, where you could see Kelly stop, dead, before collecting the ball, planting it on the dead ball line, and then tipping over it, as if he was a seesaw and the Steeden was the fulcrum. Like some arcane gymnastics display translated to the footy field, it exuded the kind of contorted genius that we normally only see on the wing, and just looked better and better with each replay, especially once DCE added the difficult sideline conversion. The Sea Eagles were now quadruple the Panthers at 24-6 with only thirteen minutes left on the clock, and had gained the solid lead they needed to recover some pride after last week’s loss to the Roosters. All they needed to do was maintain or improve upon their score, and yet Penrith now proceeded to mount an extraordinary comeback, with Josh Mansour, Isaah Yo and Waqa Blake all scoring in the space of five minutes. All of a sudden, the mountain men were only two points behind, and they got the next and final try in the most painful way possible for the Sea Eagles. The play started as simple as could be – a last tackle kick that Tom Turbo managed to clean up deftly despite some pressure from Mansour. From there, however, Viliame Kikau made a second effort, and while his hand may have knocked the footy from the Manly fullback’s grasp, it was clear, from the replay, that this wasn’t a strip, but an inadvertent consequence of the tackle, which had just been intended to bring Turbo to the ground and prevent him from advancing any further up the field. The reason it was replayed was that the Steeden ricocheted out of Turbo’s grasp at exactly the right speed and position for Cleary to scoop it up and score right beside the posts. So seamlessly did the footy shift hands that you could have been forgiven for thinking the two young guns were still in Blues mode, and with the Sea Eagles conceding a penalty for dissent a couple of minutes later it was clear that Manly’s earlier period of serene organisation and focus had come to an abrupt end. They did get one more chance, however, thanks to a bomb from DCE at the seventy-ninth minute, but with Peachey securing the football amidst a sea of Manly jerseys the game was over. While this couldn’t be as devastating as the Roosters’ win last week, it was still a pretty dispiriting sequel for the Brookvale faithful, especially because it was another home game, and the Sea Eagles are going to be asking themselves some difficult questions as they prepare to take on Cronulla next week. Meanwhile, Penrith shouldn’t rest too much on their laurels, since they were the favourites to win and could have put down points earlier if they’d been more focused. As Cleary himself observed in the post-match interview, epic comebacks are all well and good, but the Panthers simply can’t afford to be leaking so many points throughout the game when it comes to taking on the bigger teams. The lesson for the mountain men, then, is that they need to amp up their defence when they take on the Raiders and Titans over the next fortnight, in preparation for their match against the Storm in Round 25, and the prospect of the other finals footy challenges. Massive NRL fan, passionate Wests Tigers supporter with a soft spot for the Canterbury-Bankstown Bulldogs and a big follower of US sports as well.